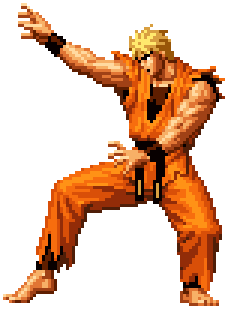 Ryo Sakazaki (リョウ・サカザキ) is a practitioner of Kyokuganryu Karate and one of the main characters of the Art of Fighting and King of Fighters games. He is the son of Takuma Sakazaki, brother of Yuri Sakazaki and the best friend of Robert Garcia. Although the King of Fighters tournament has its roots in Fatal Fury, the 1994 tournament was the first tournament in the story to use a team fighting system. Ryo was the core of the Art of Fighting Team in this first game, one that was composed of Ryo, Robert Garcia, and Takuma Sakazaki (much to the displeasure of Yuri, to which Ryo was opposed to letting her even join the tournament, although she would find her own team). Throughout the series, the Kyokugen style was depicted as a struggling family business, funded almost entirely by prize money earned from KOF and Robert's vast wealth. Despite all this, the family manages to keep two gyms running, one in South Town (setting of many SNK games), and a second in Mexico on his already deceased Mexican mother Home. Before the events of The King of Fighters '96, however, Takuma decided to retire from competitive fighting, and thus allowed Yuri to join the Art of Fighting Team. In this game, as well in The King of Fighters '97, the Kyokugen trio would always find themselves after the tournament facing Takuma disguised as Mr. Karate, telling them to train harder for the following year. In short, for much of the Orochi storyline of KOF, nothing of consequence happens to Ryo. This page was last edited on 10 February 2018, at 16:39.